Black Magic Motion from Oz Inventions, is made up of two devices. 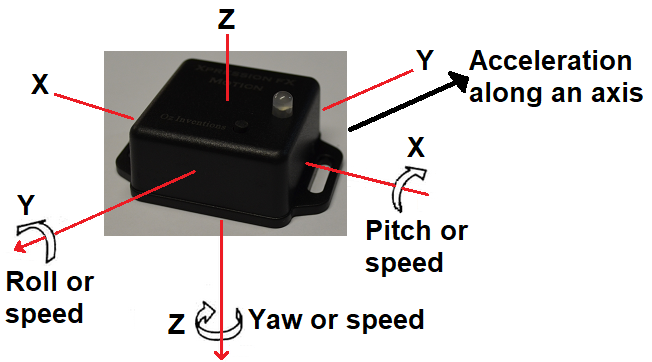 A sensor/transmitter which acts a bit like a traditional pedal and a receiver/modulator unit that connects to a foot controller port on an effects pedal, keyboard or MIDI device. The sensor has an accelerometer in it that senses acceleration and a gyroscope to sense angular velocity. The acceleration and gyroscope data is sent wirelessly to the receiver where it is decoded in software and used to control the resistance of a digital potentiometer. Just like a traditional pedal, the digital potentiometer is connected to the control port on an effects unit. Essentially as the sensor is moved about an effect parameter is moved. However, it has a heap of different features to enhance the expression and seems to be absolutely universal and even includes a control voltage output. There are models with MIDI output also that enable it to function as a MIDI controller. There are a stack of inbuilt features that enable it to do some truly unique things. There is a built in ADSR wave shaper. It can be set to run automatically, or can be triggered by moving the sensor. The ADSR is fully adjustable with rates for attack, decay, sustain, release and an overall rate. When set to trigger mode it can be set to repeat continuously or to play just a single time. The receiver can be turned on and off with a foot switch but it can also be set to turn off remotely by flicking the sensor. There is a sensitivity control to adjust this. Both the minimum and maximum depth can be set. So, for example a Wah effect can be set so that only the sweet spot is accessible so there is no muddy bottom end or ear grating top end. The maximum depth could also be used on a pitch effect to set the musical interval risen to. There is an option to set custom step sizes. So, for example the first step could be 20, then the next 25, then 60 then 30 etc. You can get some pretty unusual effects with this, and for an effect parameter like pitch, you can set musical intervals. The output can be changed in the internal menus to have 10kohm compatibility, 25kohms or 50kohms. Actually the 10kohm option is really 12kohms but is compatible with all 10kohm devices. The polarity can also be changed between TRS, RTS, TS and even CV (control voltage). The control voltage goes from 0 - 4.8 volts which gives a fair range on control voltage devices like analog synthesizers. The sensor has various methods of attachment. Double sided hook and loop tape can attach it to most things. A hook and loop elastic strap attaches to cylindrical objects such as an arm, leg or guitar neck. Each of these modes replicates the modulation effect of the heel to toe motion of a traditional expression pedal. It is a very interesting pedal that does some wonderful and also some weird stuff. The menu system was a bit tricky to use, but the features in it are really unique and it seems to work with everything out there.